Photo: Owen Wister seated at writing table, ca. 1895. Owen Wister Papers. 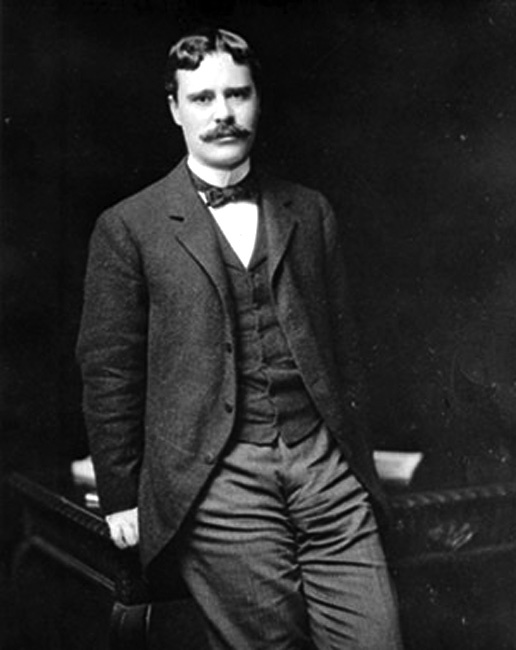 In 1902, Owen Wister published his Western novel The Virginian. The book was an immediate best seller and in subsequent years was reprinted many times and in many different languages. Since its publication, The Virginian has become a classic of American literature. It is widely acknowledged to be the prototypical Western novel. Its impact upon Western literature, drama, and film continues to be felt to this day. The Virginian, written by Owen Wister, is widely considered to be the prototypical American Western novel. This exhibit, The Virginian 1902-2002, commemorates the 100th anniversary of the publication of this classic literary work. Created from materials in the Owen Wister Papers, which are kept at the American Heritage Center, it provides insight into Wister's creation of the novel. See the AHC Catalog for more information on Wister's papers. This exhibit was formerly on display at the University of Wyoming Art Museum, Centennial Complex.